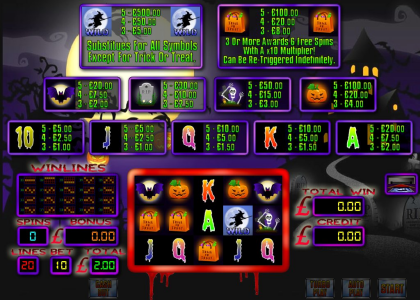 A popular seasonal pokie, vegas style slot game with 5 reels and a halloween theme. Three or more trick or treat symbols awards six free spins at a massive ten times multiplier, bonus spins can be re-triggered, but will your free spins end up being a trick or a treat? The volatility of this game is mid to high. This game has our hide meters option and keyboard shortcuts. Once payment has been made please request your game code via email to activate your game fully. Game updates and codes are sent out as soon as possible. Includes entry to our player competition!